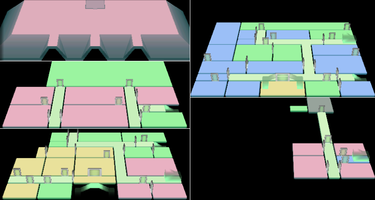 The Mirror Room is one of the many rooms inside Luigi's Mansion. It is cleared in Area Two. When Luigi enters the Mirror Room, the door seals behind him. As he explores, he sees five Blue Grabbing Ghosts in the reflection in the long mirror on the north wall. After he captures the ghosts, the lights turn on and a red chest appears. The chest contains the Fire Elemental Medal, which allows Luigi to capture Fire Elemental Ghosts and use them to shoot fire from his Poltergust 3000. 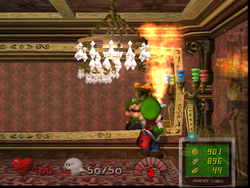 Luigi uses this new power to light up two candles in the room, unsealing the door. The Mirror Room is a long room with two chandeliers, two candelabra, as well as a torch. A small drawer and a painting on the east wall complete the room. In this room it appears that Luigi is always looking at something near the ceiling, but it is impossible to tell what it is, even by going into first-person mode. The mirror will not take the player back to the Foyer if the Game Boy Horror is used on it. This page was last edited on September 29, 2018, at 09:57.